Thanks for the nice comments and thoughtful suggestions. We read and consider every one. 84% of survey respondents (56 responses) rated their overall experience as very good and 16% as good. No one gave the experience an average or worse rating. 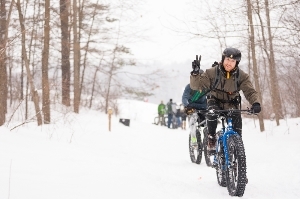 The challenges (fatbiking was your favorite), volunteers, and venue (except indoors) were the most common likes. 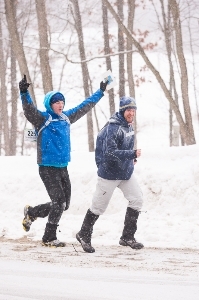 Charity challenge should be at Cannonsburg so more people can donate and/or have a donation jar at the finish. Yep. We screwed that up. Click here if you’d still like to donate. Giving other teams the answers to challenges is weak. While we do allow teams to work together, we would like to encourage faster teams to complete challenges on their own. Our policy is meant to help teams further back in the pack or who are really struggling with a challenge. Longer bike section? That would be sweet, but would mean longer lines since it’s so hard to get fatbikes (plus there were $240 in expenses to replace broken chains). So buy a fatbike from West Michigan Bike so we can do a longer loop! A couple of you wondered about the dad with his two daughters racing. I allowed that as an exception so one daughter didn’t have to sit out. We awarded the 6th place team (congrats Team Runaissance by Grand Rapids Whitewater) an additional 5th place prize since the young ladies were technically not a female/female team. Congested pre-race activities; announcements hard to hear for some. We agree. We did not know about the other event until a few days beforehand. We’ll try to get the volume and speakers dialed in better next time too but if you can’t hear, cram to the front. We will make room for you. Outdoor award ceremony was really cold. We ask for indoors each year (and are willing to pay), but we have not been able to get a room due to other events tying up all the space. We hope to address these last two issues before the next winter race; stay tuned. Our scorers do a pretty amazing job scanning almost 4,500 passport boxes for punches in a short amount of time, but we do sometimes miss one here or there. Grotto (+5 CPs), Concrete Kittens (+1), Fox in Socks (+1) and Trekker Girls (+1) all had checkpoints added to their score. Updated results. If you finished in the top five and were not at the balmy awards ceremony to pick up your prize, please email me. I can mail a Gazelle Sports gift certificate to you. Ray-Ban sunglasses added to the mix. A few traction devices and gloves. All at Gazelle Sports GR. We’ll send a nice check to Summer Journeys from the charity challenge and race profits. Still working on that final amount. Thanks for contributing. If you missed the challenge and would like to give a few bucks, you can easily donate by credit card here (tax deductible). Here’s another way to give back. Join Team in Training at one of their summer events and raise money to fight leukemia and lymphoma. Free but limited seating. RSVP via Facebook Events or email me. 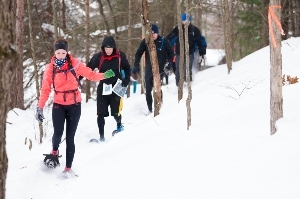 We’ll walk through the Winter Edition race map (while fresh in your mind) and other past race maps to analyze navigation strategy and route selection. Thanks again. Hope to see you at the Lake Michigan Edition. Early registration is open. You certainly are not soft people. Thanks for being a part of a race that just doesn’t attract 300 people anywhere else in the country. Must be the hard water here makes for hard-core racers. The fantastic volunteers including the Summer Journeys students. Money raised for Summer Journeys by you and race profits will help offset the cost of a scholarship(s) for qualified student(s) with demonstrated financial need to experience a travel program. Our sponsors: Gazelle Sports, SIGHT Optical Boutique, Bill & Paul’s Sporthaus, IceSpike, Tubbs, Let Us Serve You Design/Build, West Michigan Bike & Fitness, Inov-8, and Tecnu. If you buy from them, tell them their sponsorship of the race is worth it. Also thanks to Alger Bikes for loaning us two fatbikes and Jamie Geysbeek Photography and Smith Tech Photography. I figured out the mystery of why none of you were on the raffle list. That list was from the Dirty Duel trail race we put on in the fall. I pulled that list from my raffle app instead of you all. Sorry about that! I guess the “throw and catch” method was fun for a change. Here are the preliminary results. Please email me if there’s an error on our part (but be patient as I have to sort through the passports to figure out the error and re-post results). If you were a top 5 finisher but couldn’t stick around, please email me. I can mail you a Gazelle Sports gift certificate good at any of their stores (not online). Please complete our 2-minute survey. This helps us improve our races and plan for the future. We look at every comment. Those shown our from Jamie Geysbeek Photography. See more at our new Flicker photostream. If you are missing an item, email me. I’ll leave items in the Found box at Gazelle Sports Grand Rapids. Email me if you found a cell phone. I borrowed someone’s Sharpie so let me know if you want it back. When the punch broke, it was nice to have. Thanks. Found: Ray Ban sunglasses, Yak Trax, lots of orphaned gloves and hats.